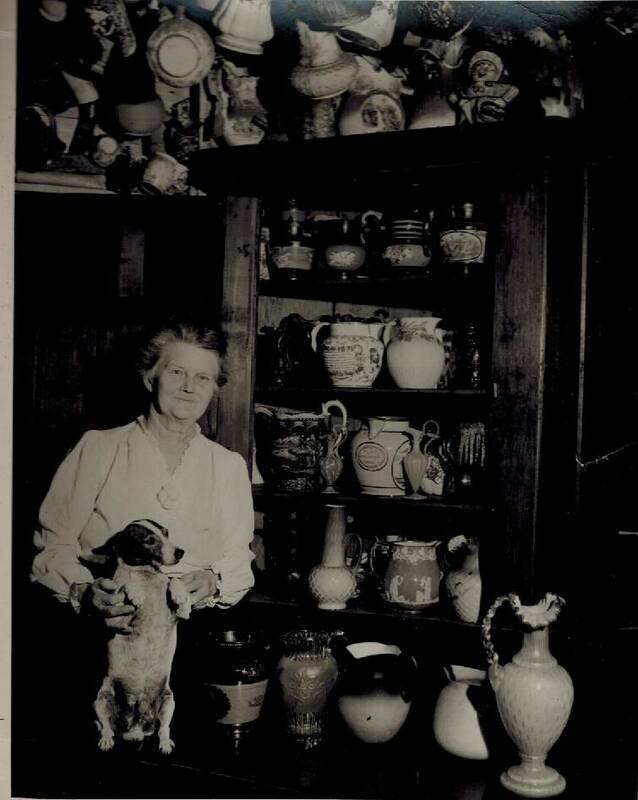 Anna Safley Houston poses with her dog, Sonny in her shop. The Houston Museum of Decorative Arts is open Wednesday through Saturday from noon to 4 p.m. and on the first Sunday of every month. The vast collection is home to Tiffany, Loetz & Carder art glass, ceramics, furniture, music boxes and more. Anna Safley Houston was married and divorced at least nine times, a hair tonic model, a buyer for Macy's and Marshall Field and the curator of 15,000 (yes, the comma's in the right place) water pitchers, guns, Native American artifacts, Southwestern pottery and music boxes. There were 50 collections within her collection. Anna was born in Evening Shade, Ark., in 1876 and died in Chattanooga in 1951. She arrived in Chattanooga in 1904, newly married to a man, who against her wishes purchased a used furniture business. When she discovered what he had done, it wasn't long until she was a single woman again. Anna owned and operated a successful millinery shop for several years but discovered she could make a living as an antiques dealer. She opened the Red Brick Dixie antiques shop and was greeted by success. It was then that she began collecting in earnest, filling five carriage houses of rental property she shared with then-husband, Jimmy Houston. She claimed that Jimmy was her favorite husband because he owned a truck. (He had a plumbing business.) They were married 16 years. One evening upon returning home, Jimmy couldn't find anywhere to sit down. When Anna told him to sit in the yard, it was the end of the marriage. The Great Depression forced Anna, who by then couldn't pay her taxes but refused to sell anything to pay creditors, to move out of town and live in a barn-like structure she built with her own hands. It was there she became a serious collector. She traveled by train throughout the United States, Canada and Mexico searching for additions to her collection. Anna never had a wealthy husband and, other than initial success with millinery and antiques, did not have money. How, you ask, could she afford such a fabulous collection? Many times she went out with a shopping list, and after locating various pieces, would have them shipped COD to Chattanooga. She would then race home to figure out how she was going to pay for her items. Sometimes she had the money or could take out a loan, but many times she would let them sit at the freight office until called for pickup. Anna would first say she had no money. When pressed, she would offer an amount well below the items' value. The freight office wound up accepting the lesser amount as it was cheaper than returning the items. This did not sit well with the shop owners who sold her the items. Anna was wary of visitors to her shop and grew more so as time went along. If she didn't know you, you probably weren't going to get in. Still, Anna needed to add to her collection, so there were times when she would part with something to purchase something better. She would go around dressed more like a bag lady than a businesswoman. An hour later, she might hop a train for a buying trip dressed in the latest fashion. There are people who say they would see Anna walking from the freight office to her shop with too many parcels, carrying what she could handle a block or so, putting them down, walking back to pick up the ones she left behind and carrying them to the first stack. She would do this the entire way. Knowing "you can't take it with you," she began her quest to start a museum, first approaching city leaders and offering them her collection (which they turned down) and then asking a trusted friend and attorney, Blaine Buchanan, to help her organize a museum. Ten years after her death in 1961, her dream was realized when the Houston Antique Museum opened at Bluff View overlooking the Tennessee River. In 1968, the collection moved a short distance to its current location at 201 High St.
Amy Autenreith is the executive director of the Houston Museum. For more, visit Chattahistoricalassoc.org.